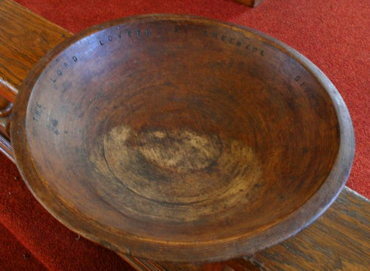 A hand-carved offering plate from a West Virginia church (ForestWander, Wikimedia Commons). Being told to tithe reminds me of those magazine covers in the grocery store checkout telling me I should use less salt and run more. I know they’re good for me, but I also don’t do them. Then, I quickly remember those seven weeks two years ago when I did tithe, which is kind of like that one week every year when I run each morning. If I imagine (and not read) what the Bible says about tithing, this makes sense because it sounds like those magazine covers—either exciting suggestions or shaming commands. These kinds of headlines don’t do much for me, but luckily the Old Testament has far more stories than headlines. The first story Genesis tells about the tithe follows Abram after he’s been to battle and won, when he meets with Melchizedek and apparently the King of Sodom. Melchizedek blesses El Elyon for Abram’s victory, and asks El Elyon to bless Abram too. Abram responds quickly, giving him “one-tenth of everything” without even asking whether the tenth should be calculated before or after taxes (Gen 14:20). All of a sudden, the king of Sodom implores him to “give me the people and take the property for yourself” (v. 21). But Abram doesn’t accept his deal, which would make sense if he rejected it on account of his desire to keep everything. Instead, he claims to have already promised God he would take nothing and only allow his men to have what they had earned to eat. He rejects the offer because he doesn’t want the king to feel responsible for Abram’s wealth. And though he never says it, that promise to God suggests that he sees God, rather than himself, as the reason for his wealth. In light of this awareness, Abram not only doesn’t take what he could have, but also he doesn’t take what he’s been told to take. Recognizing God’s gift pushes him to practice a generosity that extends to the still-powerful Melchizedek as well as the recently defeated king of Sodom. Two generations later, Jacob promises to give a tithe if God continues to protect and provide. Jacob has just seen messengers climbing up and down a great stairway and been surprised when God suddenly stands on it to extend the promise God had already given to Isaac and Abraham. When Jacob wakes up, he reacts as anyone should. He pours oil on a rock and promises that “if God is with me and protects me on this trip I’m taking…then the LORD will be my God…and of everything you give me I will give back a tenth to you” (28:18-22). Jacob responds to God’s presence and promise by giving a tithe, but he also goes further. His tithe is given and promised in expectation that God’s gift sustains. In these stories, Jacob and Abraham don’t tithe because they should. They tithe because they recognize what God has given them and will continue to give. Having heard their stories, the commandments to tithe in Leviticus, Numbers, and Deuteronomy sound less like tired headlines or billboards and more like parts of the same story of response and hope. After all, the legal codes come in a story that remembers God liberating and creating Israel. Tithing, for the Israelites, was wrapped up in remembering and releasing what God had given them to the world. Likewise, we must also remember, tell our stories, and listen to them so that, seeing where God has given us much, we can share freely. • What have you been given? By God? By others? • Are there gifts you’ve been given that other people recognize when you don’t? Are there gifts that you recognize in yourself that others don’t see? • Are there times when the well of gifts seems to have gone dry? How can giving help us to hope that God will continue to give? • What gifts have you been given that you can share? Abraham gave a tenth of his booty to MELCHIZEDEK the priest (Gen 14:20), and Jacob promised to give God the tenth if he could return home safely (Gen 28:22). The OT regulations on tithing, like the rest of the laws of Israel, changed over time. The result is that two systems were encoded in scripture, and a third developed later synthesizing them. Tithes are not mentioned in the Covenant Code (Exod 20:22–23:33), which most scholars consider to be the oldest law code in the Torah. The Code does, however, require Israelites to bring firstfruit offerings “into the house of the Lord your God,” and thus the practice of tithing is not precluded. In Deuteronomy, all the people of Israel were specifically required to bring all their offerings, sacrifices, and tithes to the Lord their God “in the place which he will choose to make his name dwell there” (Deut 14:23), namely, Jerusalem. Many scholars see this as an innovation associated with Josiah’s reform in one way or another (ca. 621 B.C.E.). Deut 14:22-29 mandated a tithe on all crops and linked this with the “firstborn” offering of flocks and herds. Each family had to bring either the tithe itself (the grain, wine, and oil) or the price they could get for selling it to Jerusalem and participate in a feast. Perhaps this was the offering one was expected to bring to the Feast of Weeks and Booths (Deut 16:15-17). Deut 14:28-29 also specifies that every three years the worshipper was to keep the tithe to give to the Levites within their towns, the resident aliens, the orphans, and the widows, since none of them had land of their own. Richard B. Vinson, “Tithe,” Mercer Commentary on the Bible, Watson E. Mills et al. (Macon GA: MU Press, 1995), 921.